The Low Down: The twins, Kyle and Emma, and their younger brother, Max, are staying for the summer with their grandfather on his ranch. The recluse grandfather that they have only seen once. Family lore has it that their great-great grandfather built a time machine, was ridiculed for it, and became a hermit. Handing Max an envelope, his grandfather tells him they need to be at the dinosaur prints at precisely eight o’clock in the morning. Then when he shows them the actual machine, the Chronal Engine, he only has time to give them a few instructions before they hear a helicopter outside, and Grandpa has a heart attack. That he predicted a few minutes before. Along with their new friend, Petra, they start their adventure when Emma is kidnapped, they travel in a Beetle to the time of the dinosaurs to find her, and they are pursued by dinosaurs through the Cretaceous Period. Along the way, they see a wrecked steamboat, an operational steamboat, many more dinosaurs and they meet Samuel, who came from the year 1919. Can they find Emma and return to the present day? Best Thang ‘Bout It: It takes place in Texas. I recognized many of the names and places of which the author writes. You certainly can tell how much the author loves dinosaurs. I’m Cranky Because: The mystery and the action was overshadowed by all the (sorry) dino-talk. At one point, even one of the characters says “Thank you, Professor” after a particularly dry explanation. Written in first person, from Max’s point of view, there were some word usage descriptions that weren’t what I would think an eighth-grade boy would use/say, such as: sconces; a girl being “attractive;” his knowledge of the flora. Also, Samuel says “I’m just saying” at one point which doesn’t sound like anything a boy from the early 1900s would just say. And would they really let a baby dino with a retractable switchblade claw follow them around like a tamed parakeet? OK, they’re kids. I’ll give them that one. Should You? : I think this book is perfect for a kid who really loves dinosaurs. It is very well suited for a child in upper elementary to about 8th grade. 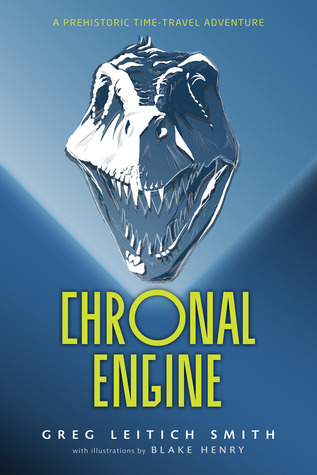 Chronal Engine by Greg Leitich Smith was published on March 20, 2012 by Clarion Books. hahaha..loved your review and i know a little boy who loves dinos and would probably like this. Great review!